MUMBAI: Ali Saleh Hussein, who has the distinction of being the oldest citizen of Yafea city in Yemen, has become one of the oldest patients to receive a knee replacement in India. Hussein, whose passport shows his age as 98, underwent a surgery on his left knee at Breach Candy Hospital here on December 11. 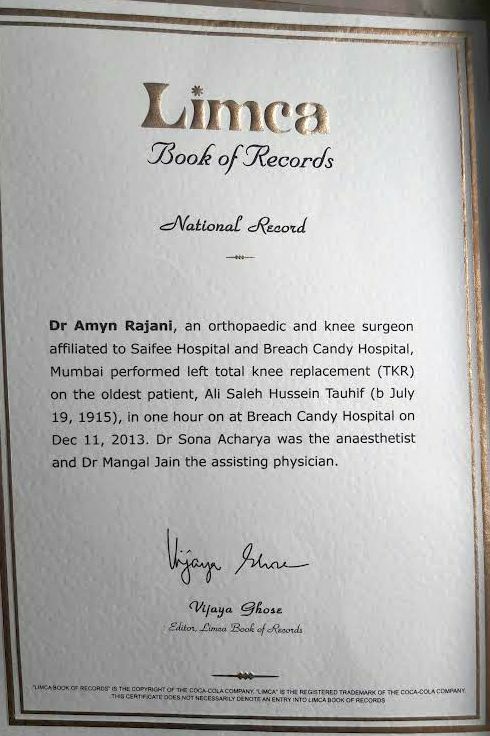 Incidentally, the Limca Book of Records says 94-year-old S N Bhatt from Chhattisgarh’s Bhilai steel township is the oldest man to have undergone knee replacement surgery in both his knees. But Hussein is clearly older. In fact, as orthopedic surgeon Amyn Rajani removed Hussein’s sutures last week, the Yemeni farmer insisted he was a 104-year-old war veteran who had fought the World War II under a “Hindu general” for the British rulers. His grandson, Mohamed, said, “My grandfather has never had any health problems except the constant pain in his left knee in the last six months.” As a friend had recently undergone a surgery in Mumbai, he decided to get his grandfather here as well. The treatment is, however, not yet over for Hussein who will have to stay in Mumbai for a month for physiotherapy. “Hussein’s knees are that of a 60-year-old man. While the left one was severely degenerated due to arthritis, his right knee is good for another couple of years,” said Dr Rajani, who believes Hussein is the oldest in the world to undergo a knee replacement surgery.